Now, if, like me, you start things without quite checking the ingredients list or alternatively the grocery store is out of ground almonds (as mine was this morning), fear not. You can make your own. Gasp! Horror. Just blend the required amount of flaked/whole almonds into fine pieces and you’re sorted. Its probably not the biggest problem if you still have some larger pieces either. My blender is like something out of a 1960’s commercial and can do very little actual blending. (You could also use a coffee grinder if your blender is on the blink or something.) As a result, my almonds were definitely not perfectly ground. I also used half toasted, half untoasted almonds simply because I had toasted almonds taking up space in my cupboard. I actually quite like the result, the almond flavour is slightly more developed. Traditional recipes call for raw almonds though so each to his own. Cream the butter and sugar together until white and fluffy. Add in the egg. Add in the flour in 3 stages, allowing the mixture to fully incorporate the flour after the first two additions. After the last addition of flour, allow for the dough to come together a little before removing it from the machine. Knead it together with your hands on a cool surface before wrapping in clingfilm and chilling for half an hour. 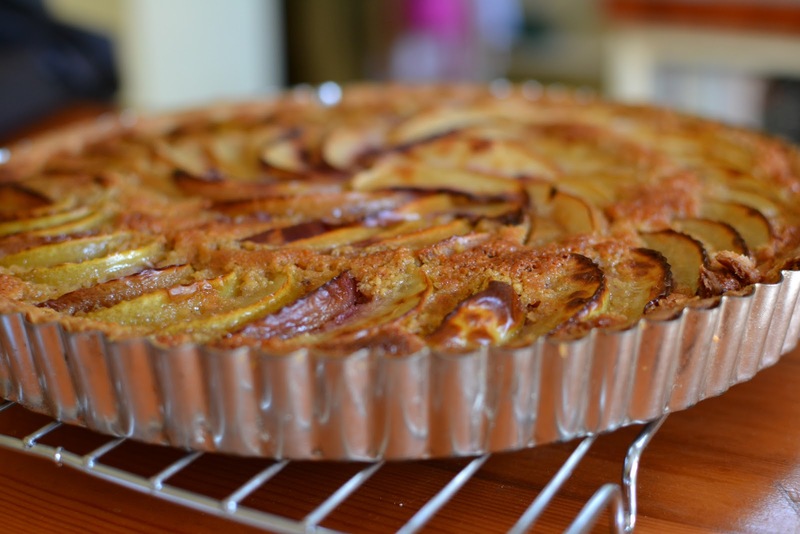 Roll out the pastry on a floured surface and line a greased, loose bottomed tart tin (22cm). There is enough pastry for 2 tart shells so I normally wrap the excess and freeze it for use in emergencies. Put the lined tart case in the fridge. Cream the butter and sugar until light and fluffy. Add in the eggs, beating well. Finally add in the ground almonds. Spread this mixture onto the tart base, using a palette knife to smooth it out. 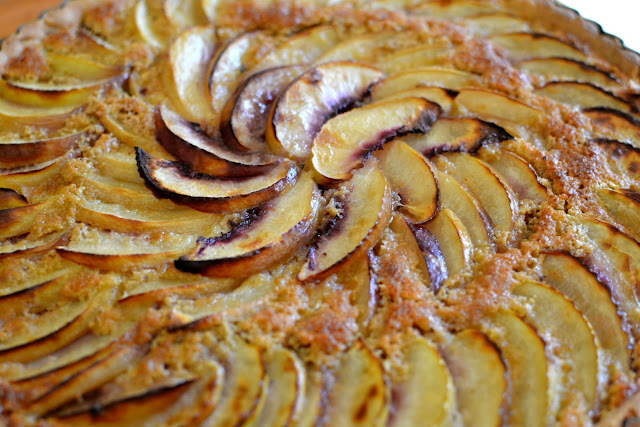 I used 4 nectarines, thinly sliced for this tart but feel free to make it with apples or pears (poach the pears first before using), or raspberries. Cover the entire tart with fruit and bake for 40 minutes. The frangipane will rise up amongst the fruit and it will be golden when done. Allow to cool before glazing with apricot glaze. Heat over medium heat until the jam and water emulsify, whisking as the mixture starts to bubble to prevent lumps. Strain and paint onto fruit tarts with a pastry brush.